Whether dreaming of highland misty crags or out for an autumn stroll, wrap up in this generous shawl. 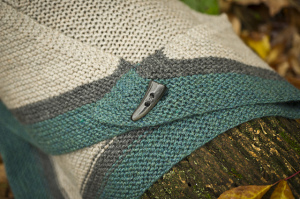 Simple and rustic – the best recipe for lazy fireside knitting. Worked bottom up in garter stitch with colour blocking and an optional antler button.